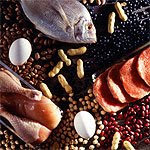 Protein is very critical biological components of life. I mean we are all of us need proteins to maintain our daily body systems. Foods such as meat, eggs, milk, cheese, beans contains lots of molecules of protein. we will use proteins to repair our body. An enzyme in the juice of the stomach starts the digestion of swallowed protein. Then in the small intestine, several enzymes from the pancreatic juice and the lining of the intestine complete the breakdown of huge protein molecules into small molecules called amino acids. These small molecules can be absorbed through the small intestine into the blood and then be carried to all parts of the body.